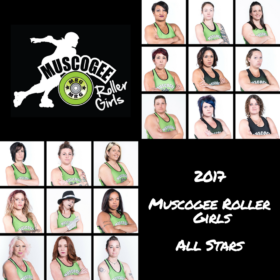 The Muscogee Roller Girls 2017 season may be over, but these fierce athletes are going into the off season determined to get even stronger in 2108. The MRG All Stars finished the 2107 with a record of 6-3 and in 165th place in the WFTDA rankings. They plan to keep working hard to improve and to continue moving up! Stayed tuned for exciting details on how you can see your Muscogee Roller Girls in action in Columbus in 2018!! !